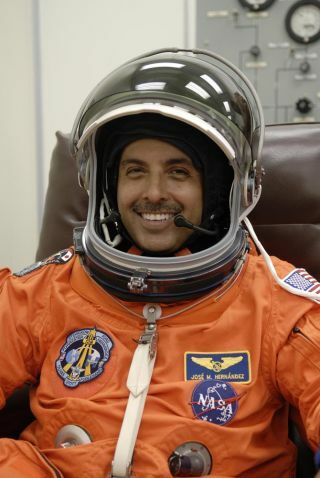 Astronaut José Hernández suits up for flight on space shuttle mission STS-128. Jose Hernandez's career path may be unique. The native of Stockton, Calif., spent his childhood traveling between Mexico and the United States working as a migrant farmer with his family. In 2004 he was selected as a NASA astronaut, and he flew on the space shuttle in 2009. Now retired from the space agency, Hernandez is running for Congress in California as a Democrat. Jose Hernandez details his journey so far in his new book, "Reaching for the Stars: The Inspiring Story of a Migrant Farmworker Turned Astronaut" (Center Street, September 2012). When Hernandez's second-grade teacher told his parents that he and his siblings needed to stay in one spot to get a good education, the family made Northern California their full-time home. Hernandez was old enough to catch the tail end of the Apollo program as a child. He watched the last manned moon landing mission, Apollo 17, on television in 1972. "I remember quite vividly Gene Cernan walking on the surface of the moon," Hernandez said. "I was hooked after seeing that. I said, 'This is exactly what I want to be, I want to be an astronaut.'" He doggedly pursued that goal, obtaining bachelor's and master's degrees in electrical engineering before applying to NASA in 2001. Though he wasn't chosen as an astronaut, he was invited to work at the Johnson Space Center in Houston as an engineer. Hernandez studied up on the qualifications of those who had made the cut as astronauts in the previous round, and followed their example, becoming certified in SCUBA diving and learning some Russian. During the next astronaut selection round in 2004, he was successful. "That was the best call I've ever received," Hernandez said of the day he learned he would be an astronaut. Hernandez trained for years, and finally flew to space in August 2009 on the STS-128 mission of the space shuttle Discovery. During his flight, he and six other astronauts visited the International Space Station, delivering a new module called Leonardo filled with supplies and science equipment. After that flight, the spaceflyer retired from NASA in 2011, returning to California's Central Valley to find it much changed. The mortgage foreclosure crisis had hit the community hard, and the area had an unemployment rate twice the national average, he said. "And yet our folks in Congress were not doing a single thing to provide relief to our community," he said, adding that when people started suggesting he run for office, he decided to "throw my hat in the ring." Hernandez is running for election as a Representative in California's 10th District. If elected, he plans to focus on bringing manufacturing jobs to his district and improving the prospects of his constituents. He would also love to help set U.S space policy, he said.